* Sussex is a service community of 4,200 residents in Kings County, south central New Brunswick, Canada. The Village of Sussex Corner is home to 1,400 people. This agricultural centre encompasses a service area of 35,000 residents. * The Sussex region is in the Atlantic Time Zone, putting it four hours behind Greenwich Mean Time during standard hours and three hours behind GMT during Daylight Savings Time. That means when it's 9 am in Sussex, it's 8 am in Toronto, 6 am in Calgary and 5 am in Vancouver. The Village of Sussex Corner was incorporated Nov. 9, 1966. Weather conditions in Kings County, N.B. 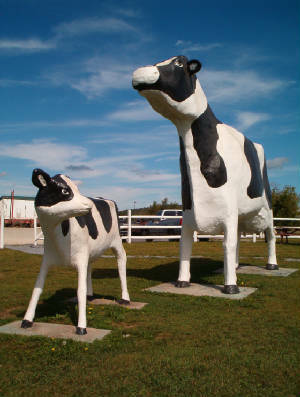 * Canada's oldest agricultural fair takes place in Sussex each August. The Kings County Agricultural Fair celebrates 120 years in August, 2016. * The history of Sussex and area is told in 26 larger-than-life murals, with four in the Village of Sussex Corner and 22 in the Town of Sussex. This brilliant collection of world-quality outdoor art makes the region the Mural Capital of Atlantic Canada. * The Town of Sussex, from the border it shares with Sussex Corner to the west end of Main Street, is 4.1 km wide. Town boundaries circle 9.03 square kilometres. * The Village of Sussex Corner encompasses 9.4 square kilometers. * Princess Louise Park, part of the former Camp Sussex military training ground in the centre of town, is 30 acres. Camp Sussex was originally 300 acres. * Poley Mountain Resort is just 10 minutes east of Sussex, in Waterford. * The Covered Bridge Visitor Information Centre, Youngs Cove, at 72 feet long, is as long as an average inflated round hot air balloon is tall. * The average inflated hot air balloon is as tall as 1.5 tractor-trailer trucks are long! Specially shaped hot air balloons can be up to twice as long as that!